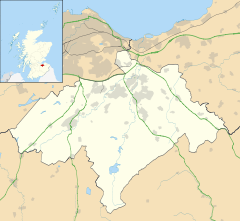 Penicuik (/ˈpɛnɪˌkʊk/ PEN-i-kuuk) is a town and former burgh in Midlothian, Scotland, lying on the west bank of the River North Esk. It lies on the A701 midway between Edinburgh and Peebles, east of the Pentland Hills. Its population at the 2011 census was 15,926 computed according to the 2010 definition of the locality. The town was developed as a planned village in 1770 by Sir James Clerk of Penicuik. It became a burgh in 1867. The town was well known for its paper mills, the last of which closed in 2004. More recently the town was home to the Edinburgh Crystal works. Penicuik has two secondary schools, Penicuik High School and Beeslack Community High School. Crystal FM is the Community Radio Station serving Penicuik & S W Midlothian on 107.4FM. In 1296 Thomas Rymer's Foedera mentions a "Walter Edgar a person of Penicok south of Edenburgh", which logically can only be what is now called Penicuik. Penycook appears as the name on John Adair's map of 1682. The ruined old parish church, in the centre of the graveyard, dates from the late 17th century. The site of Penicuik was home to the paper mill established by Agnes Campbell in 1709. A monument in the churchyard reads "1737, Annabel Millar spouse to Thomas Rutherford Papermaker at Pennycuik". Around 1770, the arrival of the Cowan family, and their expansion of the paper mill, led to the need for homes for their workers. The hamlet of Penicuik was expanded as a planned town (roughly based on Edinburgh's New Town) by Sir James Clerk of Penicuik, the builder of nearby Penicuik House, and by 1800 the population had risen to 1,700. Penicuik was the site of a prison camp for French prisoners during the Napoleonic Wars (housed in the old range at Valleyfield Mill). The former camp is now the site of a housing development in Valleyfield. A monument dated 1830 by the River Esk commemorates "the mortal remains of 309 prisoners of war who died 1811–14". It was erected by Alexander Cowan, owner of the paper mill, whose house overlooked the burial site. Penicuik hosted the inaugural Grand Match in curling, between the north and the south of Scotland, in 1847. This took place on the "high pond" on the estate of Penicuik House, not the "low pond" which is still used for curling on rare occasions. The town became a burgh in 1867. In the oldest part of Penicuik, surrounding the town centre and to the south of the former POW camp, crossing the river Esk is Pomathorn Bridge which was once a toll bridge and the main route between Edinburgh to the north and the Scottish Borders to the south. As such Penicuik has a number of ancient travellers' inns, including The Crown, and the Royal. Because of their location on such a busy caravan route, both these public houses advertise the patronage of many characters from Scottish 18th-century history, including alleged visits from Burke and Hare and Bonnie Prince Charlie. The Cowan Instituite in the town centre was funded by the Cowan family and designed by Campbell Douglas in 1893. The town, whilst generally architecturally undistinguished, contains two masterpieces by Frederick Thomas Pilkington: the South Church (originally the United Free Church, of 1862; and the flamboyant "Park End" houses on Bridge Street also of 1862. The Penicuik war memorial was designed by Sir Robert Lorimer and dates from 1920. There are six primary schools in Penicuik, Cuiken Primary, Cornbank St James Primary, Sacred Heart Primary (Roman Catholic), Strathesk Primary , Glencorse Primary and Mauricewood Primary. There are also two high schools, Penicuik High School and Beeslack High School. Paper-making is thought to have started here in 1709. The best firm evidence of early paper-making lies in the parish churchyard, where the grave of Thomas Rutherford, dated 1735, describes him as "papermaker". There were at least two established paper-mills in the town. In 1776 Charles Cowan, originally a grocer in Leith, established the Cowan Valleyfield Mills. In 1796, Cowan brought in his son, Alexander Cowan, to manage the mill. An adjacent corn mill was purchased in 1803, becoming known as Bank Mill after he converted it to produce the paper on which banknotes were printed. The Valleyfield Mills were used as a prisoner-of-war camp (mainly for French prisoners) from March 1811 until September 1814, often referred to as the Napoleonic War but more correctly at this period being the Peninsular War. In 1830 Cowan erected a monument (designed by Thomas Hamilton) to memory of 309 prisoners who died here to the north side of the mills. Apart from a small mill chapel and school, today the monument is all that survives and the mills themselves have gone. Only the road names (Waterloo Bank, Cowan Bank etc.) now echo this part of the town's history. Paper was also produced at Eskmill which has become a site for private housing. The Dalmore paper mill on the North Esk river at Auchendinny closed in 2004. Penicuik experiences a maritime climate with cool summers and mild winters. The town's somewhat elevated position (180m O.S.) means it is more susceptible to snowfall than nearby Edinburgh; over 30 days of the year on average reported lying snow between 1951 and 1980, compared to 14 at Edinburgh. Temperature extremes since 1960 range from 30.2 °C (86.4 °F) during July 1983 to −19.2 °C (−2.6 °F) in January 1982. 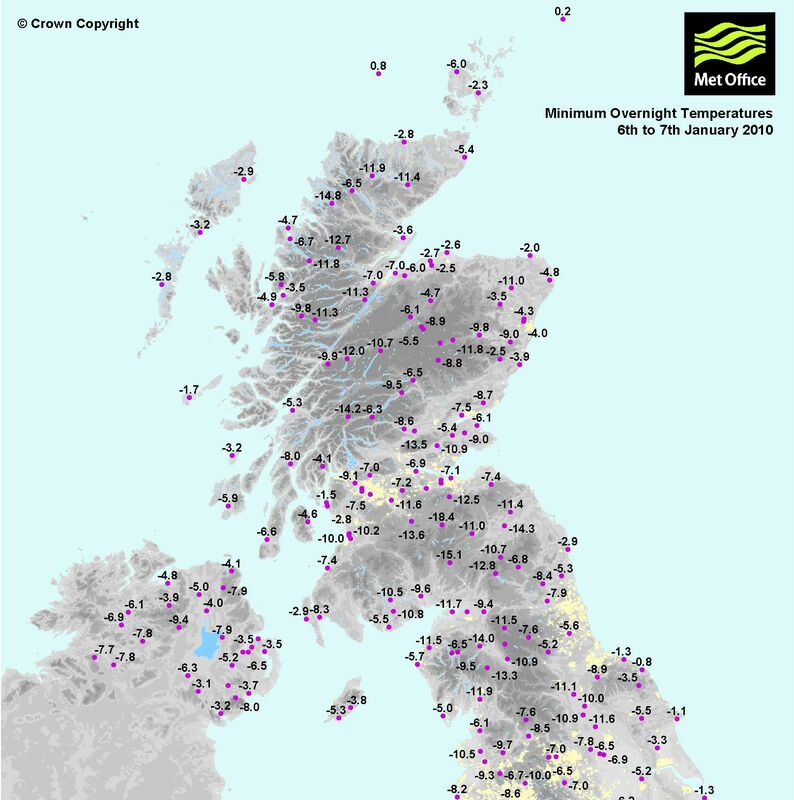 The coldest temperature in recent years was −12.5 °C (9.5 °F) during January 2010. Bank House, Penicuik. Home of the Scottish novelist Samuel Rutherford Crockett c. 1886, who often had J. M. Barrie to stay. L'Isle-sur-la-Sorgue in the region of Provence. Midlothian, Chicago (along with all other towns in Midlothian, Scotland). Wikimedia Commons has media related to Penicuik. ^ "Penicuik (Midlothian)". Retrieved 2014-06-19. ^ "Dalmore Mill". Retrieved 2014-06-19. ^ Robinson, Mairi, ed. (1999). "Some common elements of placenames". Chambers 21st Century Dictionary. Edinburgh, Scotland: Harrap. p. 1059. ISBN 978-0-550-14250-4. ^ "Full text of "Genealogial collections concerning the Scottish house of Edgar, with a memoir of James Edgar"". ^ "Map of Midlothian - Maps of Scotland". ^ "2010 Minimum". UKMO. Archived from the original on 2012-10-17. ^ "Penicuik Climate". KNMI. Retrieved 2013-04-14. ^ "Jim Aitken - Scotland Rugby Player". Sporting Heroes. Retrieved 2009-05-03. ^ Physics, Institute of. "Awards". ^ "www.illinoissistercities.org/?page_id=2650". illinoissistercities.org. Retrieved 2018-04-10.